Why go mobile? - MedusaSoft Solutions Inc.
"The internet moves fast, and if your business doesn’t move with it – then you will get left behind by your competitors"
The internet is rapidly becoming more mobile, the way people interact with your website is changing, so you need to make sure that your website is optimized to provide a good experience to mobile visitors. The biggest reason to go mobile is to get new customers. Having a web site that displays properly on smartphones is a must-have these days. Now is the time to get a mobile-friendly web site for your business! Regular web sites are hard to read on smartphones. Maybe you’ve tried it yourself? You have to pinch and squeeze your fingers to make it bigger on your phone. And it can be hard to find phone numbers or contact information. Fifty-seven percent of consumers will not recommend a business with a poorly designed mobile site. Forty percent of consumers will visit a competitor’s site after a bad mobile experience. Do you give your customers the mobile experience they expect? If you can't answer "yes" to each of these questions, you are driving away your mobile visitors. 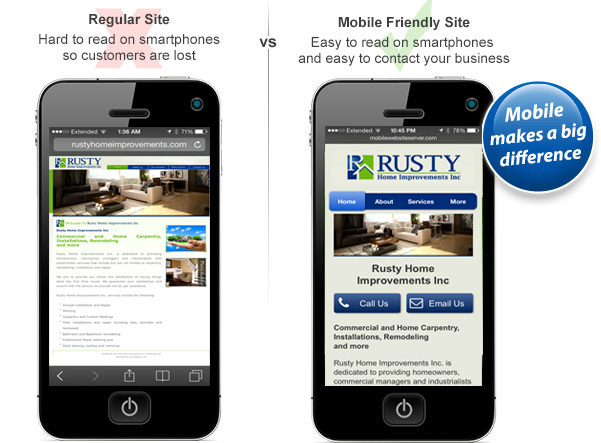 See how a user-friendly mobile-optimized website performs. Well it means, regardless of the type of business you run, if you currently own a website, you can bet that a large chunk of the people that hit it every single day, are using a mobile phone to do so! Not only are there more and more mobile users, a large percentage of them are ‘mobile only’. So if your site isn’t mobile optimized, then you have little (no) chance of engaging these visitors. The solution is Custom Mobile Websites and providing your website visitors with the best viewing experience when they land on your website using a mobile phone. Don’t worry – you don’t have to break to the bank to become mobile friendly. Call us on 408.475.8050 or use our contact form to get in touch with us today, and we can show you how your business can tackle the mobile revolution in the best way possible.